Title looks like "Yetbetpa Haykoba". Title looks like "IIIocta haykoba". 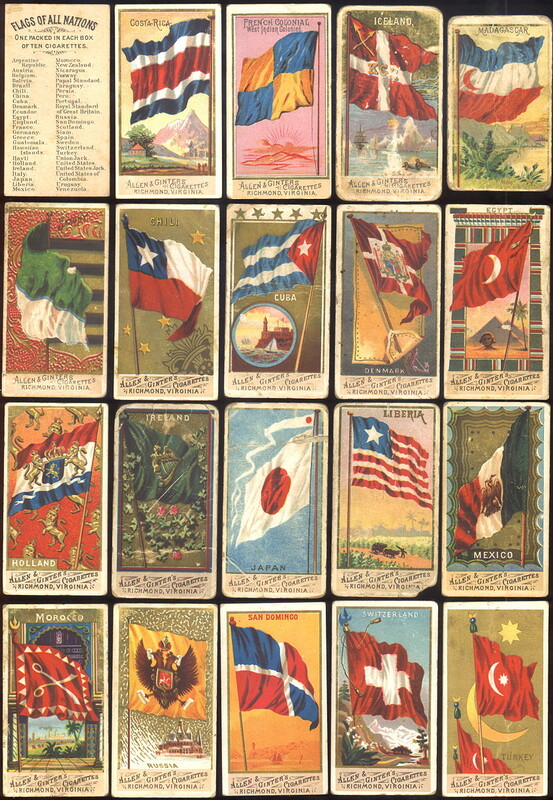 Remarks: Series of 28 cards showing national Flags superimposed on dominos; 1½×2¾″. Some available on line. Remarks: Available on line as a PDF document. Authorship credited to «Joint Committee on Printing, United States Congress». Section “School Projects” recomends for further reading the following 38 items: [bhr75], [bma70], [bma74], [bng69], [cgr73], [crd78], [dLa83], [dLe73], [dvn68], [fdi68], [fmc81], [kdd77], [kfs73], [lhm78], [Lwg77], [mas73], [mil65], [mnj71], [mri76], [mri82], [mrs52], [ngr75], [pth73], [qfe61], [rva67], [sjt78], [smi75a], [tmj72], [tnc77], [u9s68], [u9s68a], [u9s70], [u9s74], [wan83], [wep87], [wiv69], [wLe60] and [www71]. Remarks: Cigarette Silks Iron-on Transfers. Available on line: Eagle to Boar, Ostrich to Chinchilla, Musk Ox to Wolf and Crocodile to Elephant. Remarks: Series of 150 cards; each shows a college seal, pennant and an athlete engaged in sport; 2×2,75″. Some available on line. Pages: 15 + 75 pl. Remarks: Listed in [brz75] as #21. Colored chart of some 100 national flags, including Texas, Sandwich Islands (Hawai’i). Remarks: H.O. No. 89. Last edition. Remarks: Booklet. "16 Ref. 2" at the The Mystic Seaport Library website. Remarks: Listed in [brz75] as #71. Remarks: Listed in [brz75] as #135. Remarks: Listed in [brz75] under #135. Remarks: 112 company house flags. Available on line at the Cowan’s Auctions website, who sold this item for 4000 USD ca. 2003. "18 Ref. 4" at The Mystic Seaport Library website. William Appleton & Co. E. Atkins Allen & Weltch Baker & Morrill V. Azerian D.G. & W.B. Bacon, East Indies service Bush & Wildes Blanchard, Sherman & Co.
B.C. Clark Crowell, Lewis & Co. Matthew Cobb J.H. Cheney & Co. Conant & Edmands Stephen Cabot Isaac S. Croft Crowell, Brooks & Co.
Henry S. Hallett Howes & Crowell Homer & Sprague Higgins & Co Alpheus Hardy & Co Hill, Sears & Co. W.A. Harris ? Henry Hastings A.C. Hersey James Huckins and Sons Iasici, Goddard & Co Israel Lombard & Co. William Lincoln & Co. A.S. & W.G. Lewis ? William F. Parrott G.F. & J. Pattern, of Bath, Maine Page, Richardson & Co. Prince & Baker William Ropes & Co. Reed, Wade & Co. (1850), or Samuel G. Reed & Co (1860) William C. Rogers & Co. ? Remarks: House document Nº 104; 88th Congress; 1st session. Listed in [brz75] as #99. Remarks: Authorship attributed to United States Marine Corps. One of the 38 further reading items recomended in the “School Projects” section of [u9s03]. Pages: 4 + 18 pl. 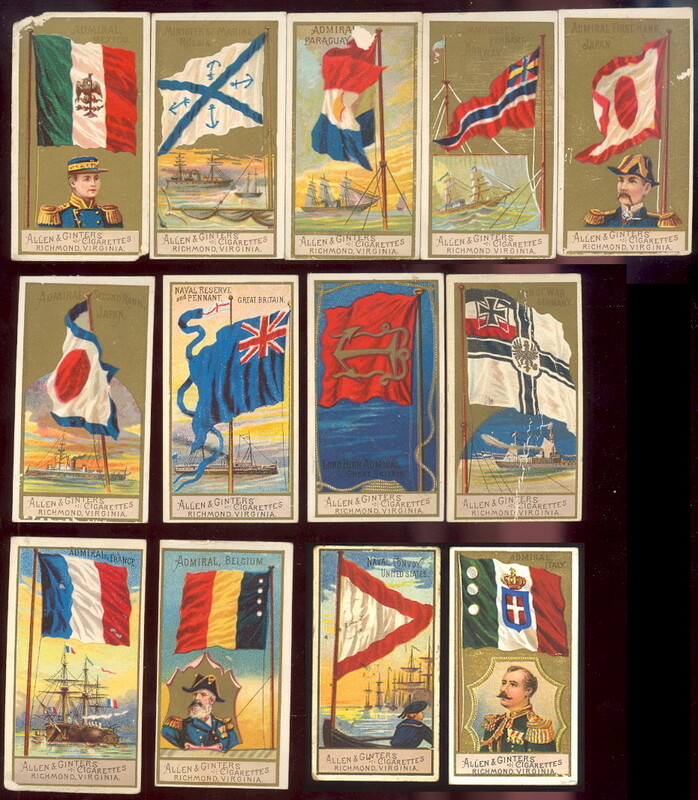 Those published up through 1938 are excellent sources of international seagoing flags; they are essentially the US counterparts to the Flaggenbuch [neu39], Album des Pavillons [pie90], and Admiralty Flags of the World [hms55]. Those from 1946 on are mainly focused on flags used by the US Navy itself. Remarks: Authorship credited to Boy Scouts of America. One of the 38 further reading items recomended in the “School Projects” section of [u9s03]. Pages: 4 + 31 pl. Remarks: Authorship credited to Library of Congress. American Revolution Bicentennial Office. One of the 38 further reading items recomended in the “School Projects” section of [u9s03]. Remarks: With burgees. Available on line. Remarks: Shows pictures of some (not all) Soviet Naval flags. Pages: 4 + 32 pl. Remarks: A small book issued by the War Department’s Chief Signal Officer. 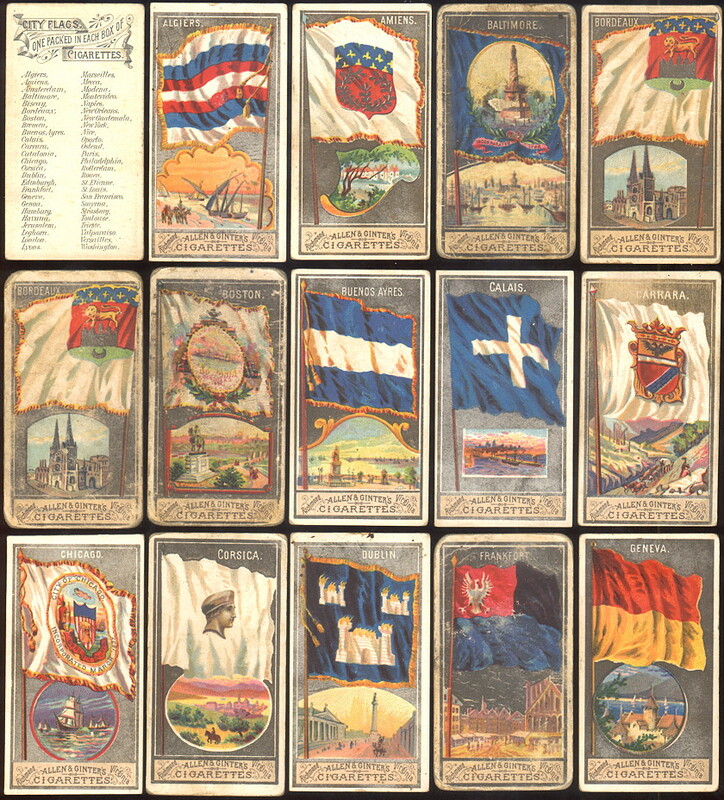 Remarks: Series of 48 cards; 1½×3¾″. Some available on line. 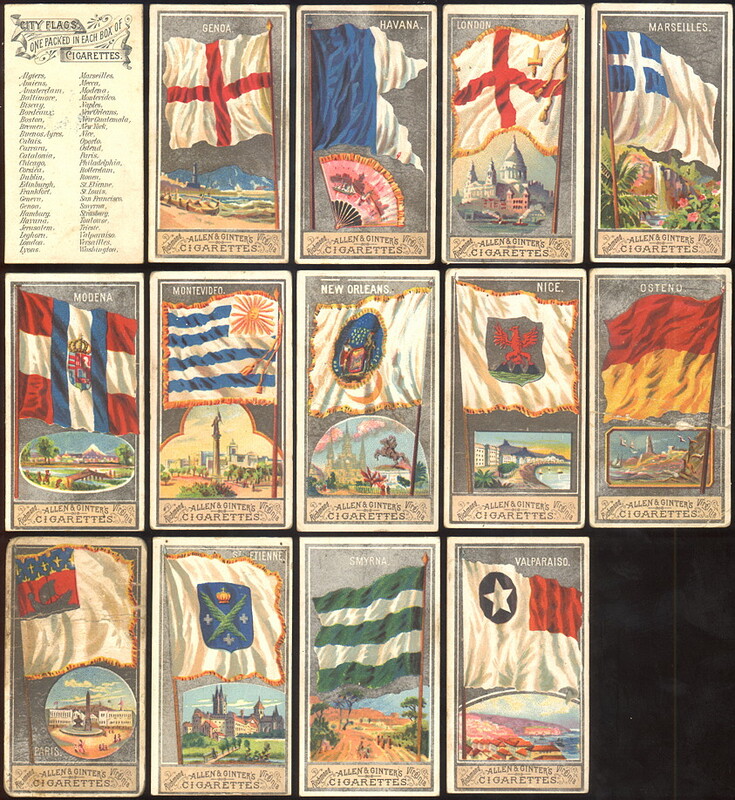 Remarks: Some of the 50 cards available on line: Algiers to Geneva and Genoa to Valparaiso. Includes as cities also Catalonia and Corsica. Remarks: Some of the 48 cards available on line. Remarks: Some of the cards available on line: Arkansas to South Carolina and Tennessee to Wyoming. Remarks: Two of the cards available on line. Remarks: New flags and symbols after communism in Eastern Europe. Remarks: Color. N60 in [brz96b]. Remarks: N64 in [brz96b]; deduced title: POW/MIA flag memo. Remarks: About a «new flag for the region of Cascadia». Available on line. Remarks: Location inferred. Ill. , maps. Listed in [brz00a] as Q2. Remarks: Ill. USD 5. 95. Listed in [brz00a] as Q106. Remarks: Date inferred. Location inferred. Ill. Listed in [brz00a] as Q37. Remarks: Listed in [brz00a] as Q116. Remarks: Ill. Listed in [brz00a] as Q85. Remarks: Pages unnumbered. Location inferred. Listed in [brz00a] as Q115. Remarks: Report / 105th Congress, 1st session, House of Representatives; 105-121 (location inferred). Listed in [brz00a] as Q114. Remarks: Ill. 1 folded sheet; folded format 22×14 cm. Date inferred. Location inferred. Listed in [brz00a] as Q89. Remarks: Location, publisher and date inferred. Listed in [brz00a] as Q3. Remarks: Title inferred. Listed in [brz00a] as Q8. Remarks: Col. ill. Listed in [brz00a] as Q1. Remarks: Col. plates. Listed in [brz00a] as Q16. Remarks: Location inferred. Col. Listed in [brz00a] as Q38. Remarks: 1 folded sheet. Ill. , some col. Location inferred. Folded format: 22×14 cm. Listed in [brz00a] as Q107. Remarks: Set of 302 stickers, each 6 × 10 cm. Date inferred. Listed in [brz00a] as Q81. Pages: 7 + 67 pl. Remarks: Order form on line. 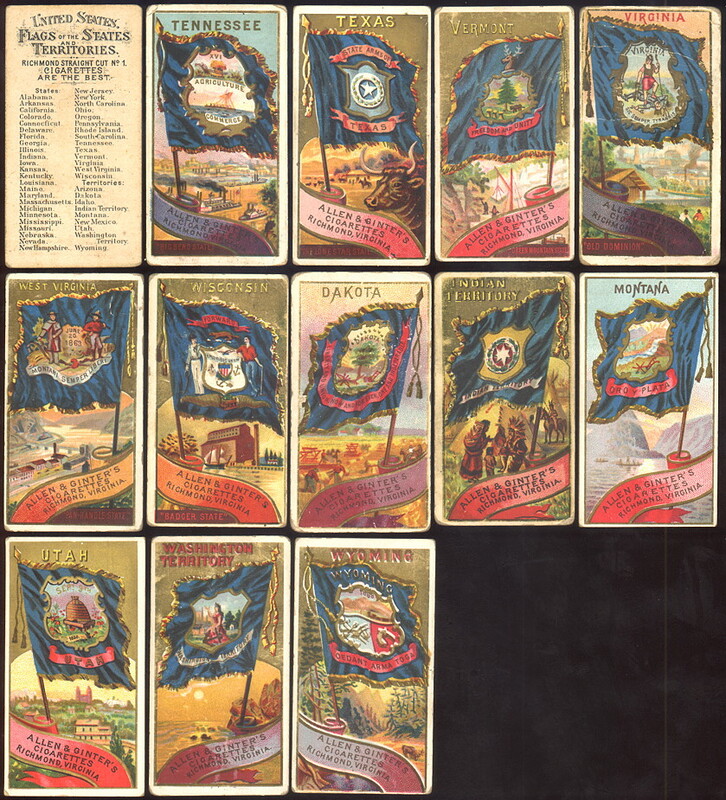 Remarks: Series of 140 cards; each shows a college seal, pennant and yell; 2×3,25″. Some available on line. Remarks: Reprinted in the Time-Life book The Clipper Ships.